One of the best parts of being a child photographer is watching your littlest subjects grow up before your eyes. Often times parents choose to purchase a baby portrait package so that all of the important milestones of the first year are properly captured on camera. It happens every time, I fall in love at the newborn session as they squeak and wiggle around in an attempt to become acquainted with their new surroundings. Next, I am stunned at the 6-7 month session at the amazing changes they have undergone since I last saw them. Now sitting up, wide eyed and oh so smiley. Finally, the one year session. Graduation day! Which is where we are in this session that I am sharing with you today. Their personality is really starting to show at this point, they are more curious than ever and MOBILE!!! Even if the babies aren’t walking yet, they are working on it and it makes the one year session so much fun. What I love so much about this stage is the curiosity and the exploration. You can see it in their eyes and in their excitement with everything they are attempting to do. It is fascinating and a stage that definitely keeps us photographers on our toes! Outdoor sessions are great at this stage because all of that curiosity and excitement can really be brought out by being outside and in a new place. We chose a local park with beautiful little wading pools, rustic benches and little hidden nooks and crannies that are sure to draw out any child’s curiosity. We had a big ball and balloons too for some added fun and color, and of course the super fun “smash cake” at the end of the shoot! It was a great session with a great family and a wonderful way to finish off baby’s first year of custom portraits. What beautiful pictures! 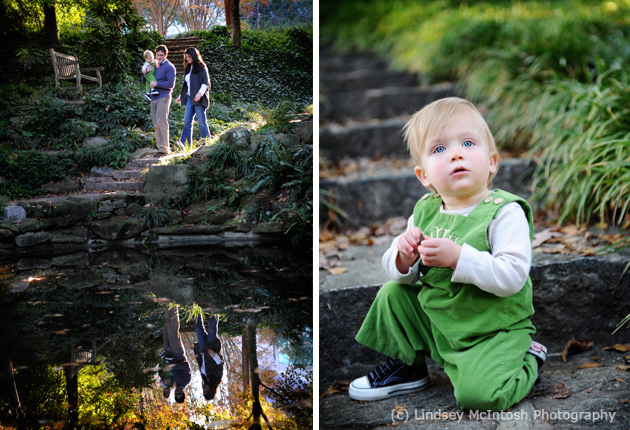 I’ve had the pleasure of working with Lindsey McIntosh Photography since my daughter was 4 months old. We take pictures for birthdays and Christmas every year – These pictures will last a lifetime and they are worth every penny we pay. Artistic, crisp, and fun – these sessions are something our family looks forward to ALWAYS! What AMAZING pictures!!! You can tell this photographer really takes an intrest in these kids and families and it shows. These pictures are so beautiful. I love the one by the water with the whole family. Precious!!! Love Lindsey’s artistic eye and always clean and fresh feel of her images. She is truly a very talented artist! Fantastic! Lindsey is the best child photographer in Atlanta. I only wish I had done a baby’s first year plan for my children. These pics are such a special way to mark the big one year milestone! Great Photographer and Gorgeous Family!